The Philippines' National Museum of Natural History ~ Mommy Meowmeow! 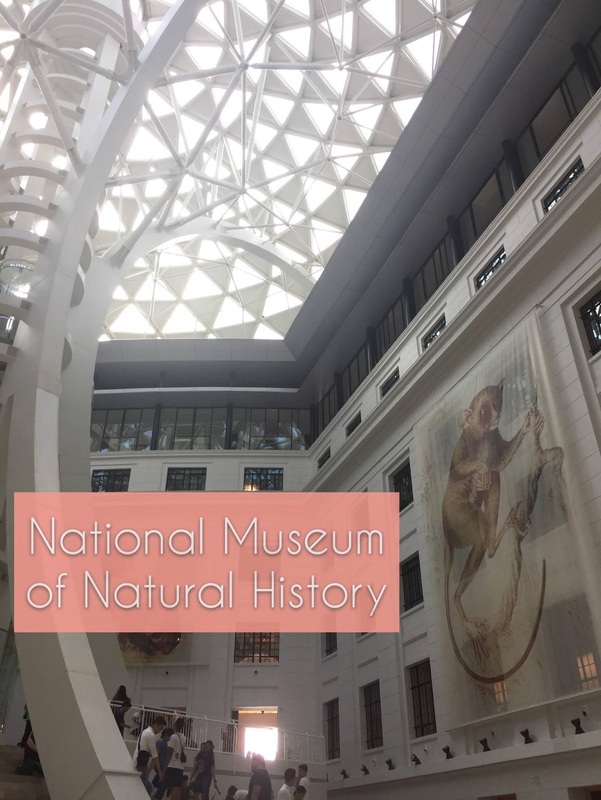 What started as a get-together brunch with my real estate broker friends, turned into a magical afternoon as we stepped into the newly-opened National Museum of Natural History. I say "magical" because it really felt just like that. It has been under construction for quite a while and I've often wondered how the architecture and interiors would pan out. When we entered the T.M. Kalaw gate (because a friend of ours has a bun in the oven), it looked freshly-painted and new but still so familiar. I thought to myself that this was, perhaps, still the same building I spent countless hours in, doing my college research work some 15 years back. BUT... once you see what's in the center of it all, it actually feels like you're instantly transported to the future. Definitely feeling the vibes of Bicentennial Man (remember the hospital where the old 'Little Miss' was confined in?). And maybe that's something they want to incorporate in this new museum - a melding of old and new. Our trip to the museum was completely unplanned and honestly just one of the many choices we had. Well, you definitely would want to stroll around after feasting on the lunch buffet at the Bayleaf Hotel in Intramuros. It was really the best decision. Thank you R for recommending it! At first I didn't get it, "What is Natural History?" "This is the Natural History of what...??" Hahaha..that was what's going through my mind as we walked around and kept our chatters all throughout. "Nature, the sum total of all physical reality, surrounding us. Nature embraces us day by day. We are part of nature, we are nature." This is true, and quite telling. Sometimes we just forget, are naive, or plain stupid. Sometimes we feel that nature is something that is external to us (think: trees, plants, land formations). That we will still be okay should something bad happen to nature (primarily due to human negligence). But we are all connected because we are also part of nature. A question was posed sometime back: "How long do you think humans would live if all plants are destroyed?" Yep, your guess is as good as mine. So...let us never forget that we are one with nature, that we are nature. Then every good decision will flow from that thought. Gosh darn that lamp design...I love it! I love this! This is actually the dome that you'll see from outside. Once inside, it looks like a giant tree and/or a rocket ship that will blast you off to outer space! There is an elevator that can bring you to the topmost part. And then you'll have to go down using the ramp. That's right, the center elevator only carries guests going up. Please keep this in mind if you have differently-abled companions. P.S. They have not referred another elevator to us. Thankfully our preggy friend did just fine going down the ramp. Really something about this look.. Kudos for having a lactation / breastfeeding room. I did not enter because baby's not with me. But from outside, it looks like they still have to tidy it up a bit. An emerald-like art installation. This is really beautiful in person. Well then that settles it! Hahaha..for all of us who may have been wondering what they meant exactly by "Monkey-eating Eagle". I'm just kidding! :D Either way, it's 100% better to have been named "Philippine Eagle". Ah, we really didn't find other displays on the topmost part of the museum. Maybe they're still working on it? Or maybe this is it already. Who knows? My golly! Ganito na pala kalaki ang large-format printing? Is it really? Probably not for the faint-hearted. Seriously, don't touch daw talaga, even if it's just a replica. You know what, this makes my essential oils-loving self sooooo happy when I saw this replica of a 'botica'. I feel really lucky that we get to try natural based products first. When we get better, that's it! When the symptoms persist, that's when we try the other side. Some activities for the kids and kids at heart. You can enjoy the different shapes and leaf patterns by tracing or coloring over them, on paper of course. So you've seen the replica. Now these are the actual bones of Lolong. Lolong's actual bones .... since we don't have dinosaurs.. So serene, grand, majestic, and sad all at the same time.. Right as we were looking for seats, we chanced upon the audio-video presentation room. Thanks for reading all the to the end! I hope you get to visit this new museum soon and learn new things too! Oh last piece of advise, don't bring a very large back because they'll ask you to check it in the counter.